With over 20 mobile IM apps recording 10 million Monthly Active Users (MAU) and above, the market is getting intense and the proliferation of new IM apps is expected to continue. While the top 10 largest mobile operators worldwide took 20 years to reach 100 million subscribers, the 10 largest mobile IM apps needed only 5 years to achieve a comparable size. The graph below is the outcome of an internal analysis performed on the 50 largest mobile messaging apps worldwide. 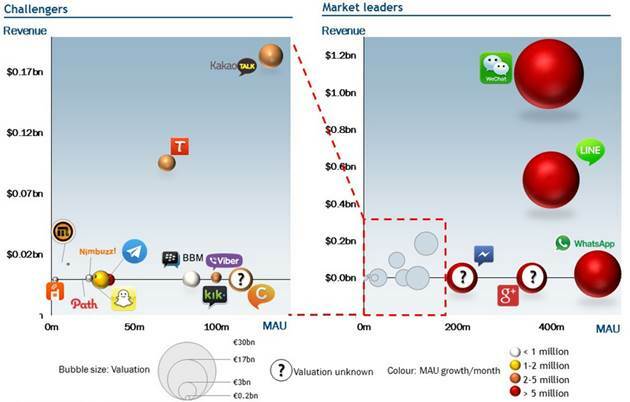 At first glance, it seems that the market is dominated by 4-5 players dictating the future of mobile messaging apps. This could be an overstatement and it’s likely that tomorrow’s dominant messaging app does not yet exist. For example, looking back, digital communications platforms such as ICQ, MiRC, AIM or MSN Messenger did not stand the test of time.